The Icom 7300 panadapter includes an Inrad RX7300, Mini Circuits ZFSC-2-1 splitter/combiner, a DXPatrol SDR, a few cables and HDSDR. See my previous post on the Inrad RX7300 modification. I have been using HDSDR as a panadapter with my Icom 7300 for a few weeks now. The SDR is the DXPatrol. I tried a cheap RTL-SDR, but got too much interference from our local AM broadcast station. UPDATE: THERE IS A MINI CIRCUITS ZSC-2-2+ AVAILABLE ESPECIALLY FOR AMATEUR RADIO. SEE HERE. HDSDR displays the 7300’s scope on an external monitor (not technically correct, but sufficient). We get better resolution and a larger picture of the spectrum scope. It’s possible to see an entire band or more and we can tune the 7300 with our panadapter. 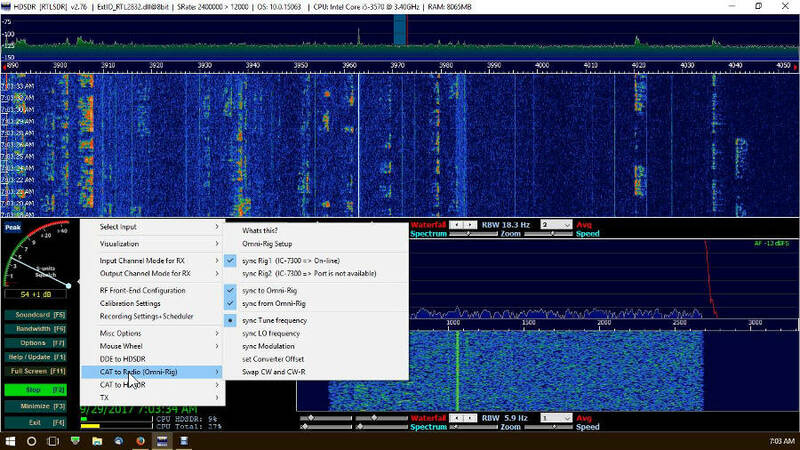 Use the mouse, point and click on the desired signal in HDSDR and the radio follows. Any changes done to the VFO, band and mode made by HDSDR are tracked by the 7300 and vice versa. With a panadapter I can see an entire band on my screen and jump from station to station ( See this short clip). This will work extremely well in a contest or even Field Day if you were searching and pouncing. It’s also just nice to have in normal operating. The LCD on the Icom 7300 is FB, but small. It is hard to touch a signal and jump to the frequency. The Icom 7300 HDSDR panadapter setup is much better for that. The DXPatrol receiver is no match for the Icom 7300 receiver, so I listen to the Icom 7300 receiver 99.8% of the time because it is so much better. 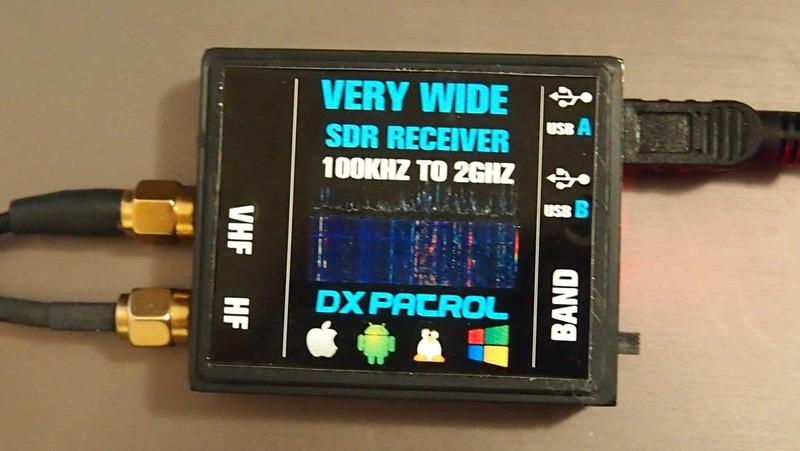 The DXPatrol just provides HDSDR with a receiver. Total cost for this is around $200. The DXPatrol was $108 and can be used for other things as well. 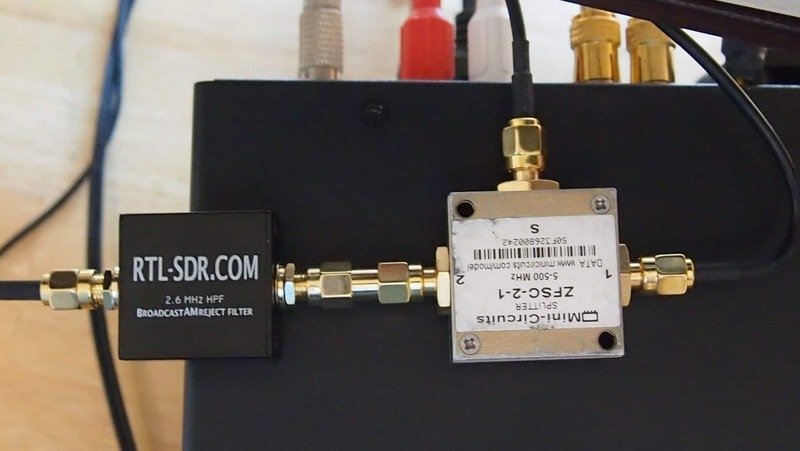 You could try a RTL-SDR for $25 and it may work for you. You could also try a simple RCA “Y” cable splitter in place of the Mini Circuits splitter/combiner. I tried one, but it had too much noise and interference. See my list at the end of this article. Install the Inrad RX7300. See my previous post. Here are the screen shots from the Icom 7300. I use two cables, a CI-V for rig control and USB for data modes. Software installation of Zadig, HDSDR and Omnirig on page 2. Sits on top of the Icom 7300. I have a IC7300 with the RX7300 and a MiniCircuit runing with a SDRplay perfectly. I use RS-BA1 V2 and HDSDR. Is it possible to run RS-BA1, HDSDR (or SDR Console) and HRD remotely all together?! 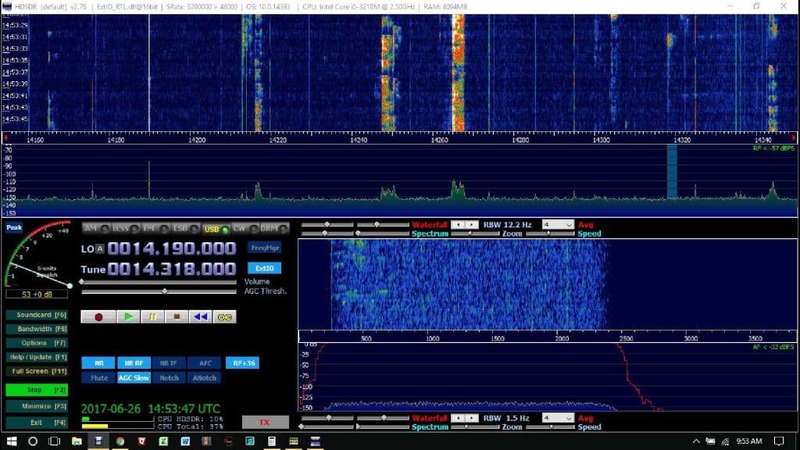 I would use HDSDR only for the waterfall and not as receiver! So I would be happy to get any note from you an this! Thanks in advance! That’s a good question and I don’t have an answer for you other than trying something like TeamViewer or VNC. I am working with RS-BA1 and testing it on a WAN. Everything is working so far on the LAN, but I am only using SSB and CW at the time. I hope to get more going with it, but it’ll take some time. Another great set of videos Rick! Thanks!! I am a little confused as to the actual physical setup. The top left picture of the back of the radio will not enlarge to see the connections. Also you note the new ZSC-2-2+, do you have a picture or drawing of that setup? Lastly do I have to install the new update? Excited to get this running but I have to replace my dead dual band UHF VHF rig first. Seriously looking at the Yaesu FTM-400DR. Good to hear from you and thank you. I think I fixed the pictures so they enlarge, thanks for mentioning it. The new splitter is identical to the one pictured just a slightly broader frequency range. I don’t know that it makes that much difference, but I would get it if I could. The firmware update? Not on the 7300 for the Inrad to work, but it’s probably a good thing. No issues have been reported. There are some more pictures on this page. It’s a simple setup, two cables coming from the RX7300 to the splitter and one cable from the splitter to the SDR dongle. I’m off the Yellowstone and will be operating portable from there. New article coming soon on that deal. Thanks for commenting and the question. It’s nice to hear from you Jerome. I’m not sure if I understand your question. To use HDSDR you’ll need what I was using (or very similar) for the best results. There were one or two Hams I saw that got HDSDR working with the USB IF Output, but it wasn’t wide enough and I never did get it working like that, hi! With my external SDR (DXPatrol), I had to use a cheap AM Broadcast filter. It did the job. You could use one of the cheap ($25) RTL-SDR USB sticks. It worked good, but again, I also needed that AM broadcast filter with it. That’ll be some setup you’ve got! Is the sdr receiver then protected?? Nice to hear from you and that’s a great question. The 7300 switches it off, so it is protected. I have heard a couple of people mention getting extra protection, but I think that is overkill. I am sure they have their reasons though. The 7300 does a fine job. I never had a problem with it or the extra SDR. You are always very kind and quick. Again, you provide a huge help in our community and I really appreciate it! 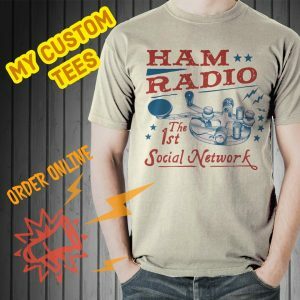 thank you so much for the great job you are doing to share your experience with the ham community! I found lot of useful information I was able to solve problems on my side. BIG Thank you! Just a question about this post. May I use any other SDR? I have an Airspy HF+. Let me know at your convenience. Keep up your excellent work. I do also like your videos! It’s nice to hear from you and thank you for the nice comment. Yes, I have heard of others using the Airspy. Just look at the instructions that go with it for the install. Very similar. Thank you again and happy DX’ing! This could be usefull: http://www.dxing.info/equipment/rolling_your_own_bryant.dx, just made the BB2 (2 port). I have split up rx on my IC7300 with that , and homemade rx loop, similar to the inrad one. I control my flex500a/pwrsdr and IC7300 using dxlaps commander. Thus having a nice panadapter on both radios. I have ordered a rtl-sdr donkle, and will play with hdsdr when that arrive. Precisely. That would be great for me too. Well, the weekend has arrived. I’ll keep scouring the web. I would think that someone has posted something, somewhere. Can the integrity of the one I have be tested on a bench? Do you have a recommendation for one of higher quality? My aim is/was to have the same antenna in which I am listening on the 7300, be the one driving the display. 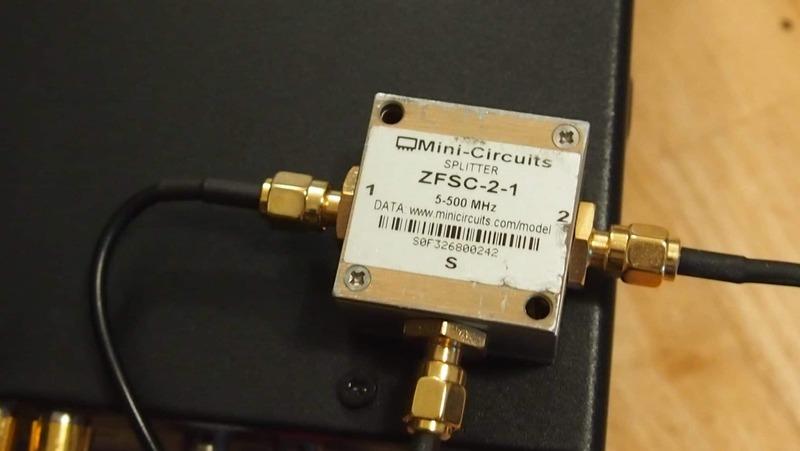 I’m using a Mini-circuits ZFSC-2-1 5-500MHz SMA 2-Way Coaxial Power Divider Splitter. I am using one of those RTL-SDR with Upconverters that you can find on EBay for about $50 +/-. I also have a SDRPlay, but it was given to me, so I have no experience with it. I did have the RTL SDR working before, but with the Inrad and splitter setup, something isn’t quite right. I’m refusing to have “the Man” beat me down on this. We’ll get there! It wil be great. What kind of splitter are you using? I seemed to have worked out the syncing, switched, unclicked, and restarted the software. That worked. One thing that seems to be occurring is that the HDSDR is not similar to the 7300 display. I have QSOs appearing on the 7300 that are not on the HDSDR display. If I understand the new setup/splitter, they should be the same, as it is the same antenna. Thoughts about that? It seems as though there’s a setting that isn’t routing the antenna RX properly to the HDSDR. I’m getting dangerously close to making things work. I would like to say these are my last questions, but let’s just call it a few more, for the time being. Please forgive my ignorance, but I’m a HAM enthusiast with little tech knowledge. This part of the hobby is a lot of trial and error for me because I don’t know what everything means. I just keep pushing buttons until something good happens, or smoke comes from the back of the unit…whichever comes first. So right now, one thing that won’t work properly is operating with the HDSR, the configurations you recommended with your photo links, and the Memory mode on the Icom 7300. Everything syncs back and forth, but when I put the Icom 7300 into memory mode to quickly move to a band/frequency, it bounces back to VFO mode. Thoughts? Also, can you share the configuration settings on the HDSR relative to “Front End Configurations” and “Calibration Settings”? I believe these are critical to align the IC 7300 with the HDSDR display so they are coordinated accurately. Thank you. I tried mine with memory mode and it works FB. Are you using Omni-Rig? What SDR are you using David? The Front-End Configuration is different on each that I have. So is your SDR connected to a separate receiver antenna via the splitter and the IC-7300 antenna transmit via the the SO-239 jack? I am I understanding this correctly. Would you provide the critical settings for the ICOM 7300. In other words, how do I set the CIV, USB interface, etc.? I understand the software settings as you described, but I don’t understand the transceiver part of the equation. Thank you very much. Today’s technique lies many horse heads in front of me, so to be absolutely sure. 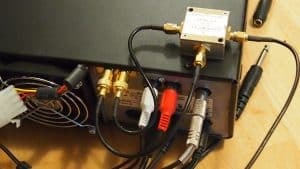 Did I understand you correctly that a splitter makes it possible to use the same antenna for listening to my SDR receiver as to send 100 watt output from my IC 7300? I have a RSP2 from SDRplay and accompanying SDRUno software. Can I use this in your panadapter concept? I do not have a separate RX antenna. Will a splitter be god enough protection for the RSP2 while my ic-7300 transmitting? I own an ICOM 7300 and very interested in this panadapter. Pse send me information. Sorry for the delay. What information that is not in the article? Hi Rich….. Did you use any protection for your SDR? I noticed my SDR Play is really sensitive. Nice to hear from you and great question. I did not. When researching this I was told that when transmitting from the 7300, the receiver antenna lead is disconnected and RF goes to ground. Do I need to buy the Icom CT-17 cv-v AT programming cable ( EBAY ) in order to use the DX PATROL setup in my IC7300.?? In other words, I want to buy the complete hardware to operate SDR IC7300 with a laptop, where to buy ?? Thank you and nice to hear from you. That’s a very good question. I used the CI-V for rig control and the USB for digital modes. You can use just the USB cable to get the DXPatrol working and then decide later if you want the CI-V. Ebay is a good place and also Amazon. I use the 3 ft cable mostly. There’s also the opportunity to use VSPE. It’ll split the USB COM Port for you. Thank you again and I would try the USB cable first.